On the very right in the black plastic tray are the tomato seeds I started March 1. Pretty small and sad looking plants if I do say so myself. On the very left are the so-tall-they-need-to-be-supported tomato plants I bought at the farmer’s market yesterday morning, also started March 1. Clearly, I need a greenhouse. At the very least, I need to spend some time reading about starting my own seeds if I’m going to do it again. On the plus side, they came up. So, that’s a success. They just didn’t do much. They were in the sunroom, but when they sprouted and then sat there, I got concerned they weren’t getting enough light, so I carried the tray out to the garden, where they have sat and done nothing for a few weeks now. I have a friend who had the same experience, so it was slightly comforting to hear she had the same luck I did. I keep telling myself, at least they came up. A good many of the seeds I harvested myself from plants I grew or outstanding tomatoes I bought at the farmers market that made such a good sandwich, I saved the seeds from the heel of the tomato, so I count being able to harvest my own seeds a success as well. The tomatoes inbetween the stunted and the leggy are the ones I bought at Southern States. Once again, I got myself an Early Girl, because I really, really like being able to pick tomatoes in June and early July. I am a girl of very little patience. I also attempted to start some pepper plants, and only had one of them pop up. Yesterday though, as I started setting pots where they were going to go into the ground, I noticed the Serrano seeds had finally sprouted and this morning I noticed they put out more leaves! I had received those seeds from a friend last spring and put them in the ground about this time last year and had limited success with them, for various reasons, but mostly because I thought they went in late. This year, I’m right back where I started from with them last year, but I intend to show them much more attention and see where that gets me. At the very least, I hope to get at least one pepper for me to harvest the seeds and try again next year. In the background of that photo are my bolting broccoli rabe plants. I’ve never grown them before, can’t say we’ve eaten them either, but thought I’d give them a whirl. I plan on yanking them in the next few days and I’ll let you know how we like them. Currently they are taking up the space usually dedicated to my pole beans and certain members of the household cannot believe it’s May 1 and I don’t have my beans in the ground yet. Nevermind that we have a chance of frost for a few more weeks…. All together, I think I have 8 different types of tomatoes planted this year. I went ahead and stuck my tiny sprouts in the ground anyway, we’ll see how they fare. 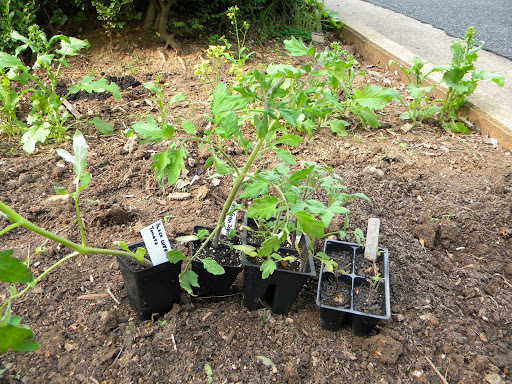 I have a black cherry tomato, a German cherry tomato, my Early Girl, some Bigger Boys, Mr. Stripey, Green Zebra, Mortgage lifter, and the mystery awesome sandwich tomato (which I sense may be a mortgage lifter, but we’ll have to see what they do before we can make any determination). In addition to the Serrano pepper, I planted an Anaheim, a hot pepper who’s name escapes me right now (and since it’s raining, I’m not running out there to check) and a pimento pepper. How awesome is it going to be to have pimento cheese with my own peppers?!?! I’m a total food gardening geek I am. While we’re on hits and misses, my volunteer strawberry patch isn’t faring as well as I’d thought it was. As I feared, a good portion of it didn’t make it through last summer’s drought and neglect on my part. It was also over run by wild strawberries, so it’s not quite as big as I thought it was. But it’s still there. The volunteer patch under the compost bin seems to be happy and expanding though. And I seem to have what appears to be a spider mite on my mint and it’s quickly moving to the black eye susans, newly planted sage and my rosemary. Must do something about that this week. That’s the all gardening news around here. Yeah, get a greenhouse and a matching chicken coop. The poop will be a big help for you. I love the tomatoes that grow under my compost bin! I have lettuce coming up and I planted my tomatoes and peppers today…I want to plant green beans but ALWAYS have some issue with them…I will be watching you to get tips on stuff!!! !